A wildfire fueled by strong winds raced across communities in the Sierra foothills in Northern California on Thursday, devastating the city of Paradise and sending thousands of residents fleeing for their lives, authorities said. 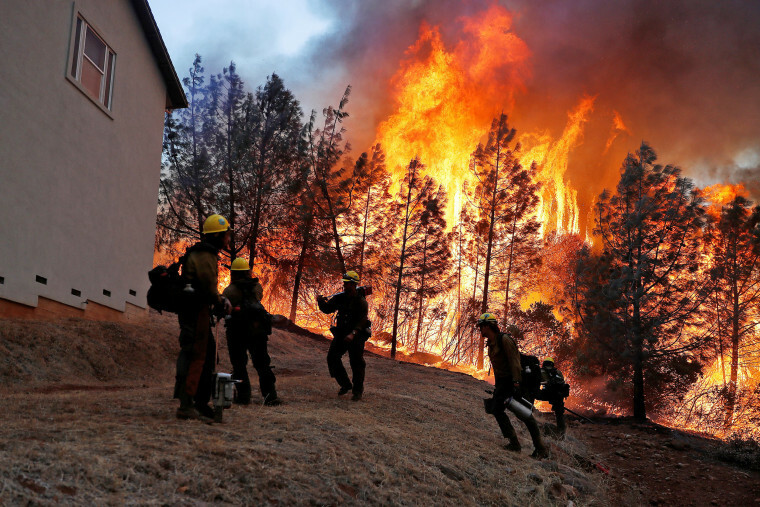 The fire, which was dubbed the Camp Fire, started at 6:30 a.m. (9:30 a.m. ET) near Camp Creek Road in Butte County, north of Sacramento, and spread rapidly, fueled by strong winds, fire officials said. "Pretty much the community of Paradise is destroyed — it's that kind of devastation," Capt. Scott McLean, a spokesman for the California Department of Forestry and Fire Protection, or Cal Fire, told The Associated Press on Thursday night. "The wind that was predicted came" and pummeled the city of 27,000 residents in the Sierra Nevada foothills, he said. The fire had more than doubled in size to 20,000 acres and was at 0 percent containment, Cal Fire reported Thursday night. At a news conference, Chief Darren Read, commander of Cal Fire's Butte County Unit, described "significant" losses of structures and multiple injuries, including injuries to two firefighters. Residents in Pulga and Paradise, about 90 miles north of Sacramento, were told to evacuate on Thursday morning. By the afternoon, residents of Magalia, Concow, Butte Creek Canyon and Butte Valley had also been told to leave — more than 20,000 people in all, including all patients at Adventist Health Feather River Hospital, the hospital confirmed. By Thursday night, more than 29,000 customers in Butte and Plumas counties were without power, utility agencies reported. The California Highway Patrol reversed northbound traffic on State Highway 99, diverting all vehicles southward from Skyway. Brian Wilson of Magalia was at work when the fire erupted and spent much of Thursday frantically trying to reach his wife, who was at home with their two young children. "There's no way to get ahold of anybody up there. The lines are all down," Wilson told NBC affiliate KCRA of Sacramento, his voice cracking. "She's at home with two kids by herself. I can't do anything." Wilson's wife later called to say that she and the children had managed to escape safely, KCRA reported. Meanwhile, in Southern California, a brushfire that ignited Thursday afternoon quickly grew to encompass 10,000 acres only a few miles from the scene of the shooting at a bar where a gunman killed 12 people in Ventura County. The Hill Fire sparked in the Santa Rosa Valley jumped U.S. Highway 101 at about 2 p.m. (5 p.m. ET) and in less than an hour was nearing the boundary of Thousand Oaks, fire officials said. It jumped U.S. Highway 101 within 12 minutes, Ventura County Fire Chief Mark Lorenzen said. Its progress slowed as it reached areas stripped of fuel by previous fires and was assessed to be burning 5,000 to 7,000 acres by Thursday night, he said. Ventura County emergency officials ordered mandatory evacuations for the communities of Camarillo Springs and Dos Vientes and parts of Bell Canyon — about 8,000 people — along with California State University-Channel Islands and its 7,500 students, faculty and staff. The commander of Point Mugu, part of Naval Base Ventura County, separately declared a mandatory evacuation. Assistant Fire Chief Chad Cook, the incident commander, said Thursday night no cause had been determined and that firefighters were being hampered by Santa Ana winds — the strong, dry inland winds that often bedevil coastal Southern California. One firefighter suffered a minor injury, he said. "The Santa Ana winds quickly outstripped our resources," and they're expected to strengthen overnight, Cook said. "It's a recipe for fire."